This screen shot was taken over a 20' flat. 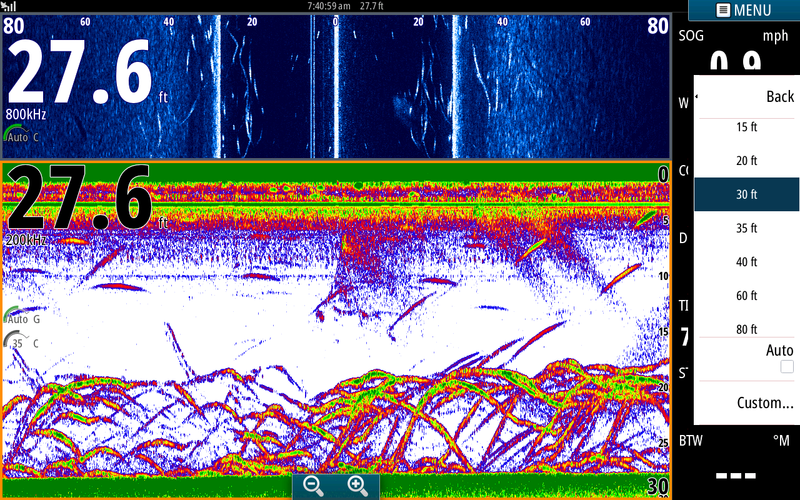 What you are looking at on the sonar screen is a mixture of White Perch and smaller Stripers [less than 20inchs]. We caught nothing but punks here. This is a screen shot of some nicer Stripers. 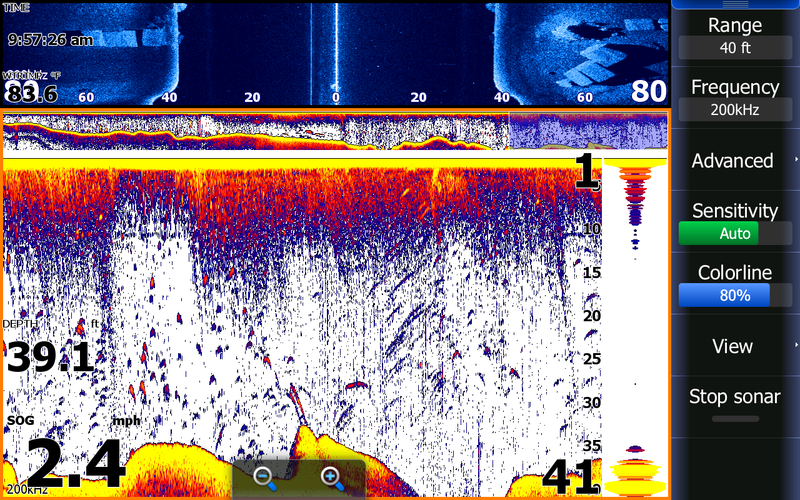 I was working a 30 foot flat and noticing Stripers in the channel [not catchable] and better Stripers up onto the flat [larger arches on sonar screen about two thirds across the screen near the bottom. 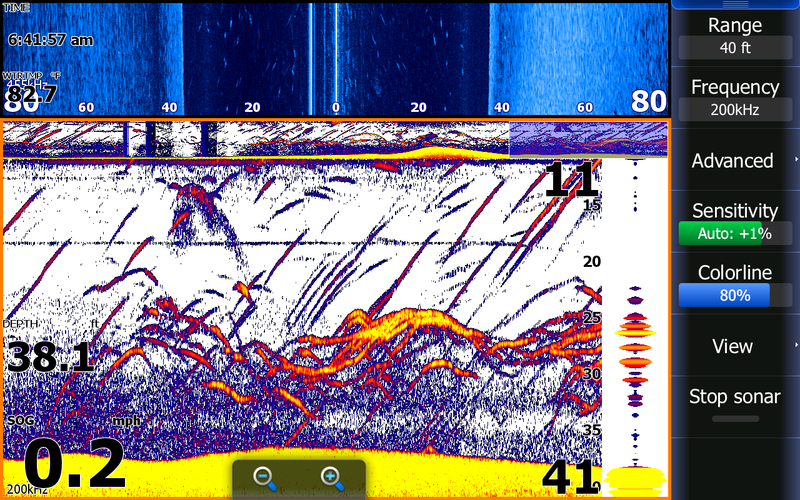 Also notice on the side scan page the the larger Stripers [white vertical lines] to the right of the boat about 40 feet out. 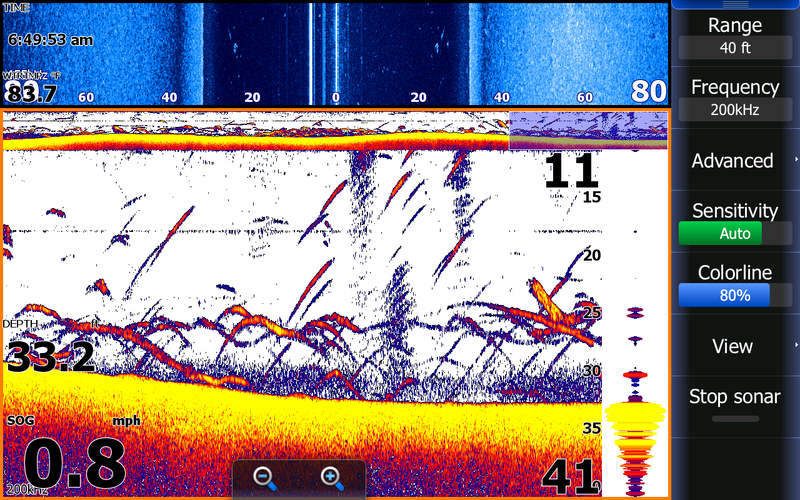 These Stripers were decent size, notice the shadows out behind the white dashes on side scan. This screen shot was from very early this morning. Today is my first day using this new product and this shot was taken prior to me dialing in the unit. 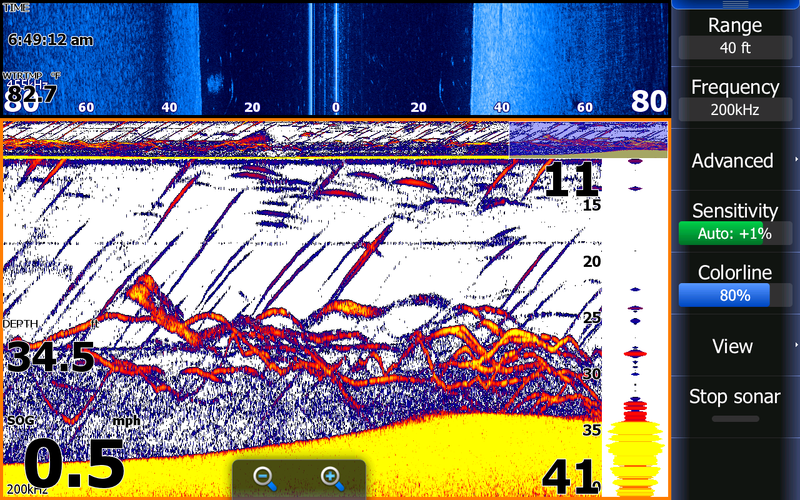 The blue side scan screen shows Stripers on both sides of the boat. 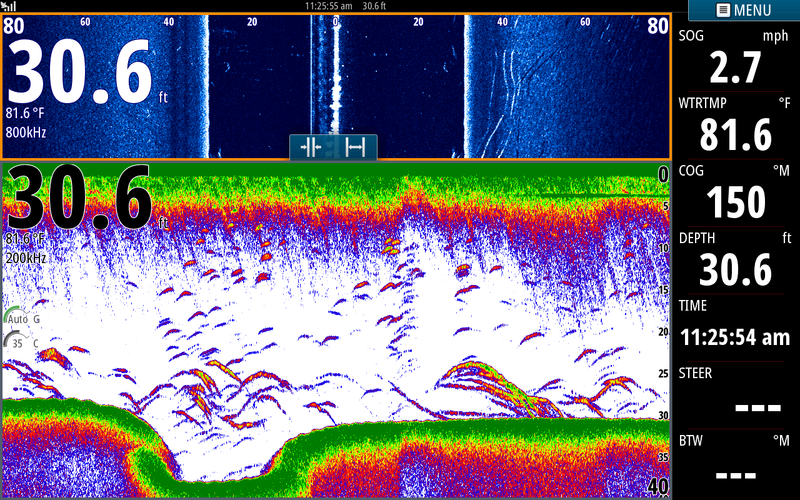 The sonar screen shows our bait and sinker at 25 feet most of the way across the screen but it disappeared when we got close to the school of Stripers on the right side of the screen. In this shot we had come out of the Stripers but still was around plenty of bait. 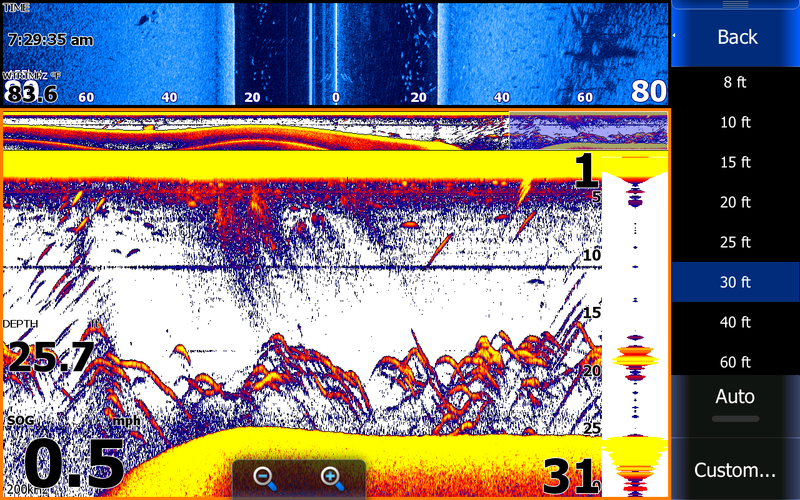 Note in the side scan screen bait [small verticle dashes] to the left side of the boat and Stripers [larger dashes] on the right side of the boat. The school of bait about a third of the way across the screen is a school of Herring with a nice Striper below it and just past midway of the screen is a school of Gizzard Shad. This pic and the one above this one was taken with not enough gain [Sensitivity], but I adjusted it for the next two pics. 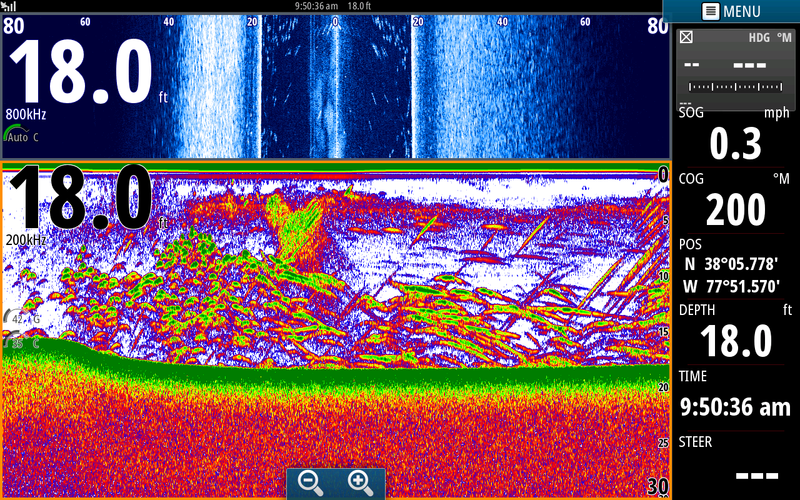 This is a shot of some random Stripers around a tight school of bait on the left and below a broken up school of bait towards the right side of the sonar screen. For those of you who want to know where I am fishing I have my coordinates up on my information bar. 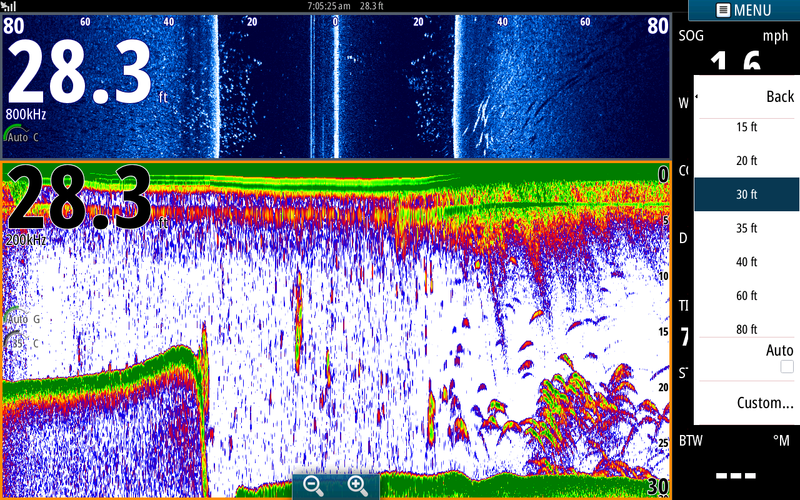 Based in Norway and a part of Kongsberg Maritime AS, Simrad manufactures advanced sonars, echo sounders and catch monitor instrumentation for the world's fishing fleet. 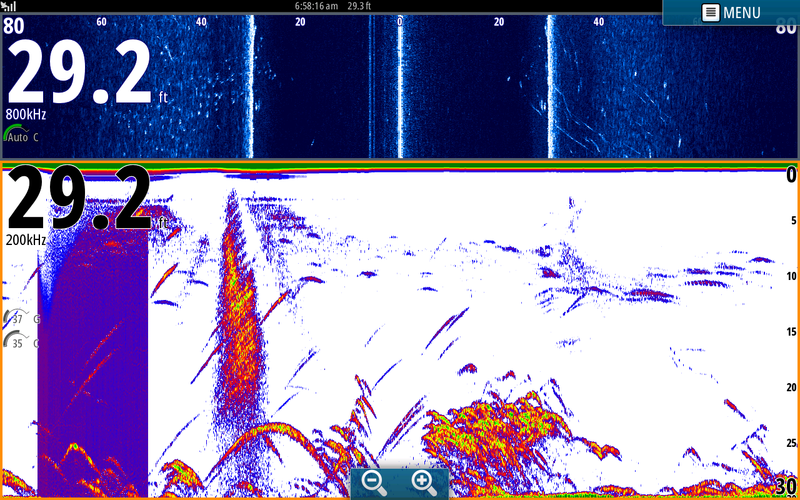 Simrad is also a world leader in equipment for fishery research equipment. Single and multibeam echo sounders and sonars are used on research vessels all around the world. 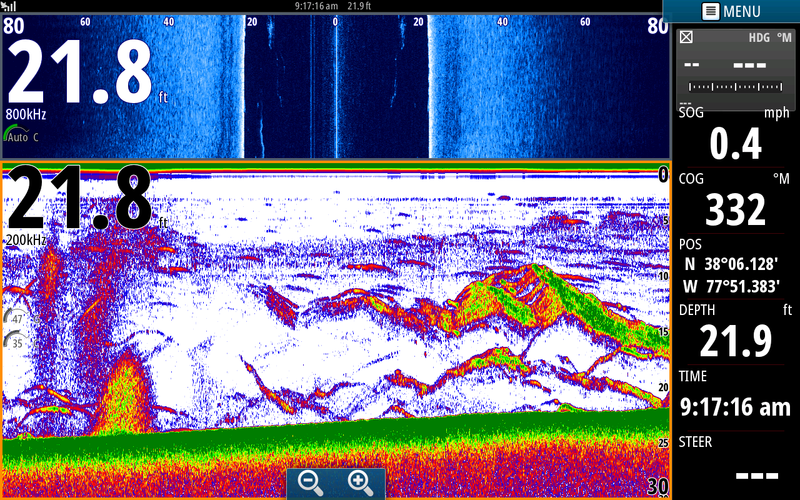 Scientists rely on Simrad's technology and accurate readings. Simrad is a sister company to Lowrance owned by Navico. Simrad is introducing its line into the fresh water market and Anthony and myself have been chosen to field test the units being Pro Staff for Navico. 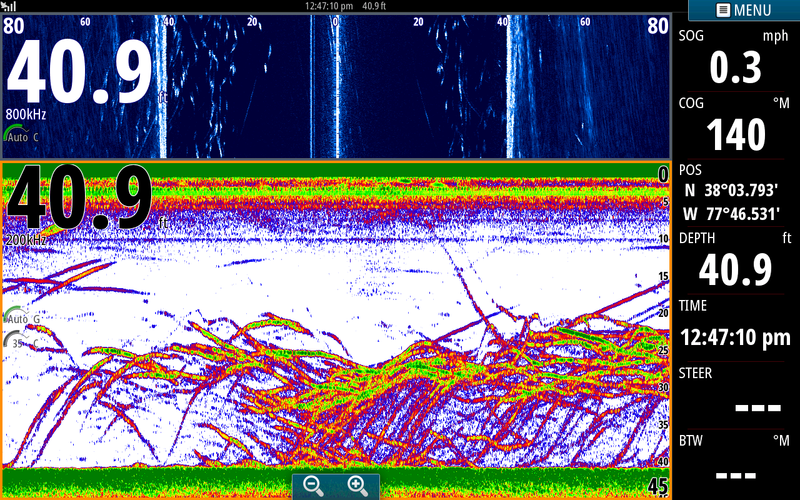 We will continue to use Lowrance products and post screen shots of both brands. As I become more familiar with the new products I will review them on this site. The unit that I am using is a NSS12 EVO 2 Touchscreen. In the future I will explain some of the features that I may or may not like. 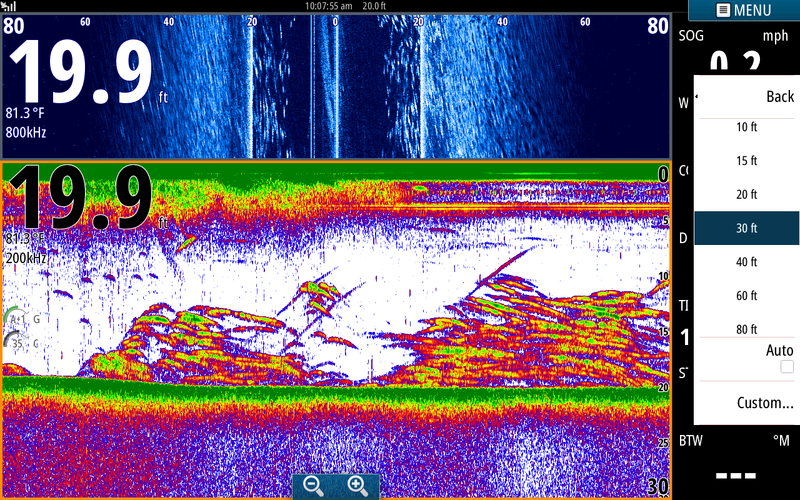 My heart lies with Lowrance which I have used exclusively since 1986 and will continue to. After all it has put me on a couple fish over my career. We are excited to test Simrad and to work with Navico and also Greentop Sporting Goods who sells Navico products. 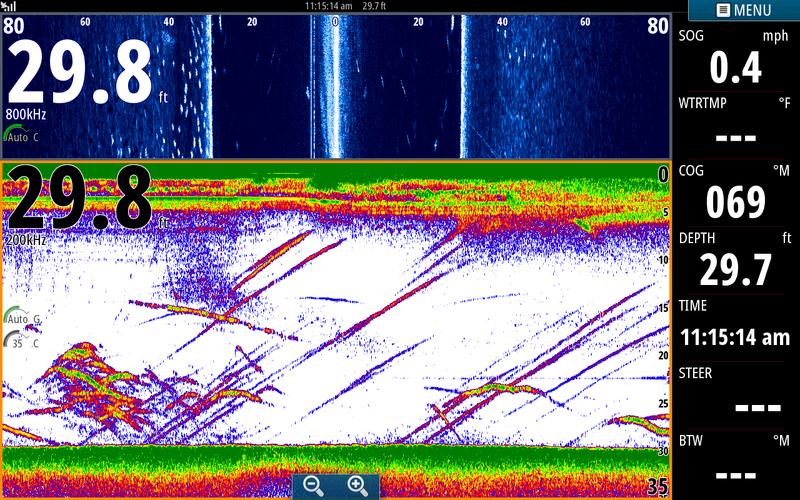 These are a couple of screen shots of a school of Stripers we worked earlier this week. some very nice fish. The bottom shot is also showing decent fish. Don't forget to come down to Greentop this Saturday for Customer Appreciation Day. There are great sales going on in all departments and I will be there to help with your electronic needs of questions. Come down and enjoy the fun! Clients often ask what Stripers look like on the screen when I am running at speeds. In this pic we were catching Stripers on the bottom in 25 feet of water. I decided to move so in the middle of the screen is the disturbance of my motor when I got up on plane. 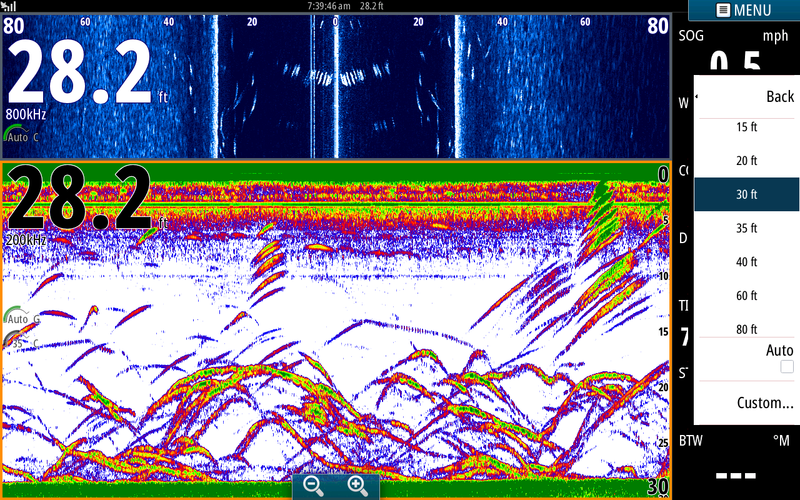 The right side of the pic near the bottom shows what the Stripers look like at 15 mph. 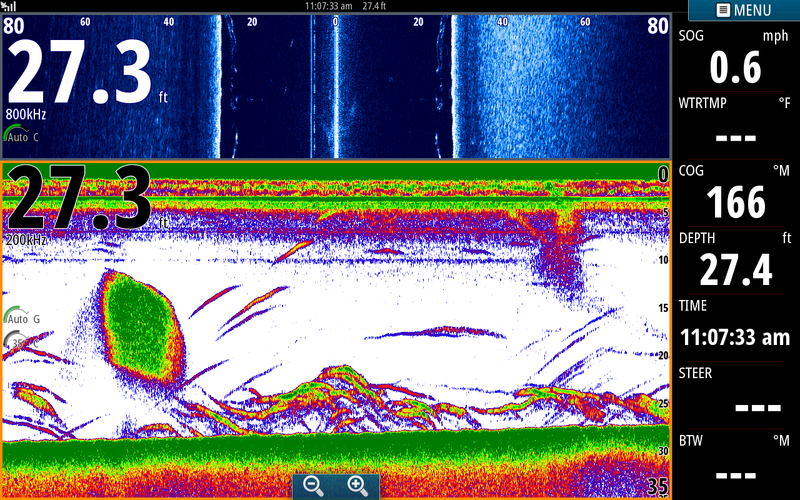 This is a shot of a school of Stripers where all of our rods hooked up once we got over the flat. On the left side of the screen the boat was over the channel where we did not take any hits. As I came up onto the feeding flat we started taking hits then all of our rods hooked up on the right side of the screen. I popped this pic as I was netting fish. 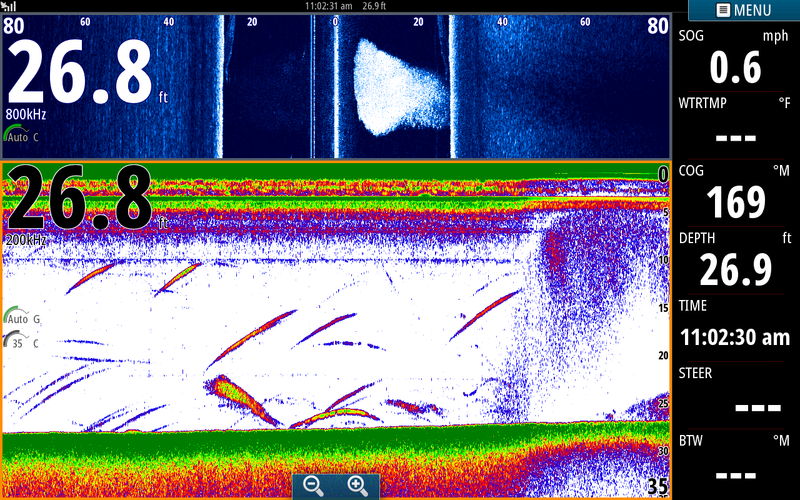 You can also see on the side scan many more fish to the right side of the boat. Yea, I maneuvered the boat to the right and continued to hook up. In this shot I had already looked for schools but none were developed yet. 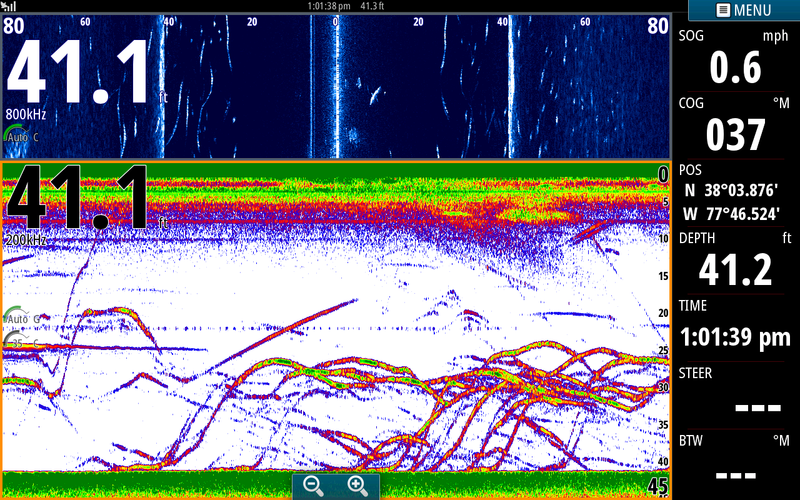 Stripers were scattered all over a 33 foot flat suspending a couple of feet off the bottom. You may notice in my history bar that I had been working the flat for quite some time. The fish were not feeding aggressively but we hooked up about every 5 minutes or so. This is a picture of the old railroad trestle at the splits. On the blue side scan screen up top you can clearly see the old slabs of concrete off to the sides of the boat. 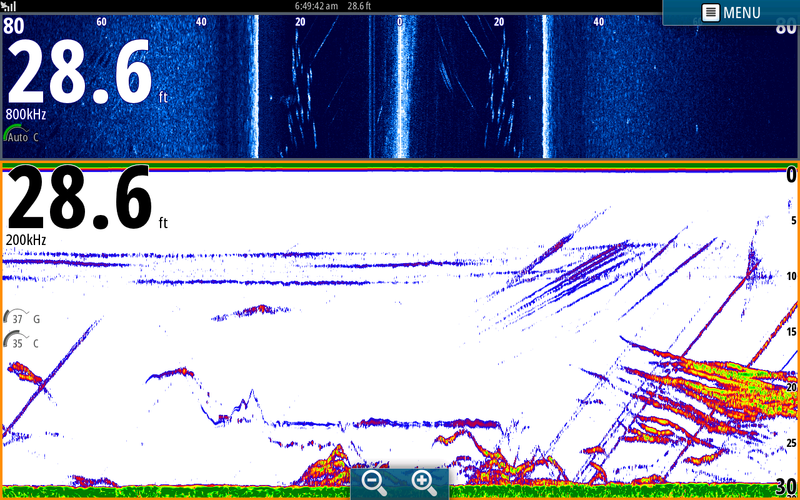 This is an instance where you can see something hard on the bottom on the sonar screen but the structure screen clearly defines what is 40 feet under the boat. These pics are click-able which may help you see more clearly. Greentop is having a big sale next week and Saturday, August 16th is Customer Appreciation Day. I will be there in the electronics department helping anglers choose the right unit for their needs and also helping owners of Lowrance with questions they may have. There will be good deals going on in all departments. If you want a new Lowrance but can't afford one now consider knocking the dust off of a couple of your old firearms and trading them in to the gun dept. 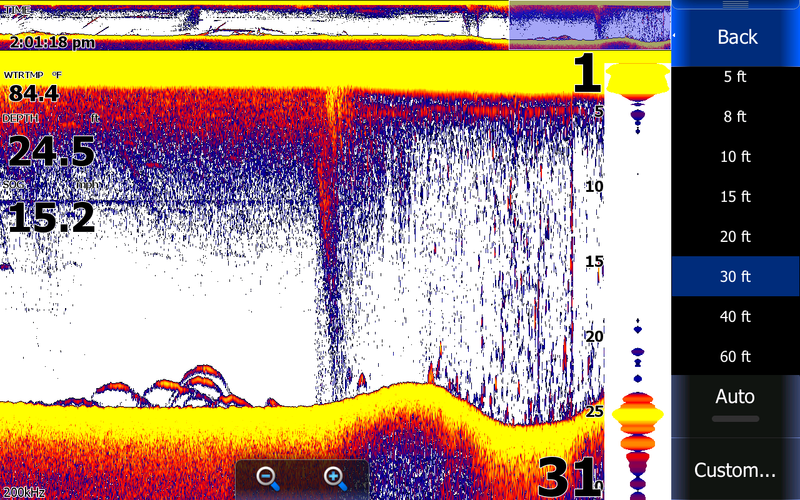 Now is the time to put a new depthfinder on your boat to be ready for the fall season. I caught 200 baits early this morning then picked my clients up at High Point. I looked for a short time for a school but with the rain and clouds I did not expect to see much. Instead I simply set up in an area where I thought we would be able to catch fish. Before I could get many lines out Dan hooked up with our first and largest fish of the morning. Hopes were high but I was still concerned about the weather and how it would affect fishing today. We worked a little further and got punked then starting catching Cats, not good. I moved around taking hits everywhere but it did not seem the decent fish wanted to feed. We used up our baits then went and caught 75 more and hit different areas. I was hoping for a great stringer today but we had to settle for a dozen keepers, some of them nice fish. I was talking on the phone to one of my other guides on the way home being pretty bummed out about our catch and he cheered me up by saying "Your bad days are better than 99% of everyone else s good days". Still wish today was better.